Fall (or Autumn) officially arrives at 4:18 this afternoon. As one of my blogger friends put it, "this is usually the driest time of year." However, 2009 has been anything but dry. Down to our south, parts of Atlanta have seen up to 20" of rain over the last 48 hours. Floodwaters have even engulfed parts of the interstate system near the I-75/85 connector. See the article 'Major Flooding to Our South' on Examiner. Speaking of a lot of rain, we'll continue to see rain in our forecast throughout the rest of the week. Thundershowers are already beginning to show up on radar this morning. The expectation is for up to another 1.5" could fall across Middle TN (more toward the west) by the weekend. We stand at 11.56" and don't need too much to surpass the 12.24" recorded in July. Hazardous Weather Outlook report. 1890-Hails falls and accumulates in Strawberry, AZ. Five days later, there are still drifts of hail 12 to 18 inches deep. 1983-Nashville drops to 36° and Crossville drops to 33°, both tie an all-time record for month. 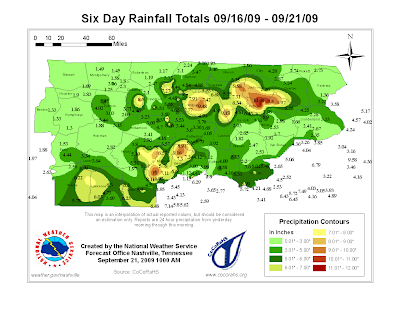 2000-.03" of rain falls at Oklahoma City, OK breaking a 54-day string of days without rain. It is a new record that shattered the old one of 39-days.